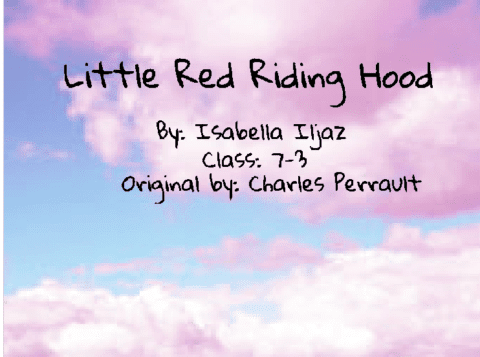 For a school project, I had chose to write an alternate ending to the original fairy tale “Little Red Riding Hood.” Although there are several versions, I used the version by Charles Perrault, where once the girl tells the wolf she is going, he eats up her grandmother, waiting for the girl to come by the house and disguises as the grandmother. There is a tragic ending where the innocent girl gets killed by the wolf. I the original story, the villain doesn;t get what he deserved, so I allowed the roles to be reversed in my alternate ending of the original story. I used Scratch Animations and Storyboard That to bring my animation to life. In my script, I was faced with the challenge of coming up with an alternate ending to the original story. This came to me as a hard task, because of how renowned the original story already was. My script was my base and was able to bring what I thought the original story could act as. Through the storyboard and the animation that then came, I was able to bring my interpretation of the story into a real animation that could resemble a show or movie. Revising and editing towards the end took time, but at the end, everything came together pretty well. 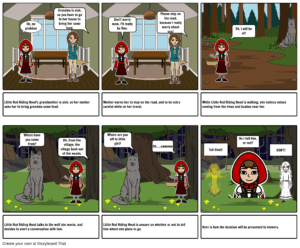 Little Red Riding Hood–Remixed by Isabella is licensed under a Creative Commons Attribution-ShareAlike 4.0 International License.